Riding the crest of the waves with a totally evolutionary vanguard cuisine offering an experience he entitles calm gastronomy is one of a kind Chef Ángel León. At his Puerto de Santa Maria restaurant Aponiente, Ángel has conjured up an epicurism with the enchantment of the world under the sea. He has proven himself a master investigator of Plankton, marine lettuces and algaes, which he filters in his own concoctions and gastronomic gadgets. Additionally, he is an expert in fish, shellfish and seafoods and their preparations. Furthermore, he has invented CLARIMAX for clarifying liquid ingredients to create transparent consommés and utilises olive pits in place of carbon for braising, grilling and barbecuing on open flame. His pure Andalucian hedonism has brought him many awards at Madrid Fusion and on Canal Cocina T.V. His father, a medical doctor and researcher coupled with his medical doctor mother have instilled in him the investigative nature. His ultimate research project at the University of Cádiz derived in the development of the state of the art CLARIMAX, a kitchen machine constructed by JP SELECTA in Barcelona. Whether coaching, cooking or fishing, Ángel is detail oriented and a perfectionist. His inspiration, inventiveness and “the product” culinary philosophy has enabled him to dazzle diners with his dramatically provocative presentations at your table. His extraordinaire vanguard culinary methodology, unique ingredients an enrapturing touches from his home land all provide the most incredible dining experience one can ever have. This is an adventure in which you shall savour the mysteries of taste, aroma and textures inspired by the evocative food notes in Ángel´s 22 seat unique magical Soho Manhattan style little restaurant. Furthermore, he has catalogued 100.000 marine species and has constituted algaes, marine flora and marine fauna as the most quintessential of his extensive work with phyto-plankton and the ideal means of culinary diathermy for heating. Mar: Your culinary philosophy ? Ángel: The product and no chemicals. I specialize in the natural. Mar: Who are your mentors ? Ángel: Chef Joel Robuchon of 3 Michelin star Restaurant L´Atelier where I worked in France for seven years and for three years in Toledo at La Casa de Templo where I was learning about the historic roots of Spanish culture including the Arabic Moorish and the Sefardic. Ángel: I have always had an obsession with the sea and I enjoy fishing with my dad, cleaning, cutting and preparing fish. Mar: What does Plankton taste like ? Ángel: Here is a sample. The palate tours many new territories of taste while submerging your senses in an astonishing awakening. Plankton contains the highest measurement of Omega 3 thus, this is for health. How would you describe the taste of Plankton ? Mar: It tastes sort of like a fusion between creamed spinach with a slightly oily finish similar to extra virgin olive oil or wild salmon – must be the Omega 3 consistency along with tasting notes of fresh marine herbs, algaes and sea salt perfectly merged together. I like it. Mar: Thank-you. Do you fish for Aponiente ? Ángel: Yes I do, however I am also very community minded and I coach crews on ships and small fishing vessels who are working for 15 Euros hourly. I have taken 30 day fishing excursions bringing in 50 tons of fresh fish. I have also wanted to mention, that I have sourced fish in Cádiz for 4 Euros a kilo and in Madrid these species sell for 40 Euros a kilo. Mar: I believe you would do quite well in politics! What exactly are you doing with plankton ? Ángel: Plankton groves. I filter 1 gram in 17.000 litres of water. The Omega 3 content is the most numerous of all edible species and / or plant life. Plankton is the cellular origin of all. Mar: I understand that you have invented some gourmet gadgets and kitchen machinery ? Ángel: Firstly, CLARIMAX which clarifies a large variety of liquids and soups. I have also created a micro algae diathermy which is a robot capable of making liquids transparent in color. Through extensive research and investigation, I have found that olive pits can be used instead of toxic carbon for grilling, barbecuing and braising of fish, vegetables and meats and the olive pits impart their golden nectar on the exteriors of the products one is grilling. Mar: Do you have any research investigation projects scheduled for 2010 ? Ángel: I am in the process of a joint venture, in which we are collaborating on a baby foodline with a Japanese manufacturer. Mar: And your dream trip ? Ángel: To lose myself in the Alaskan Arctic on a boat. Ángel: Complicated, hard. I have 22 seats and 11 employee team staff members. Crazy ! Mar: Science and ideas ? 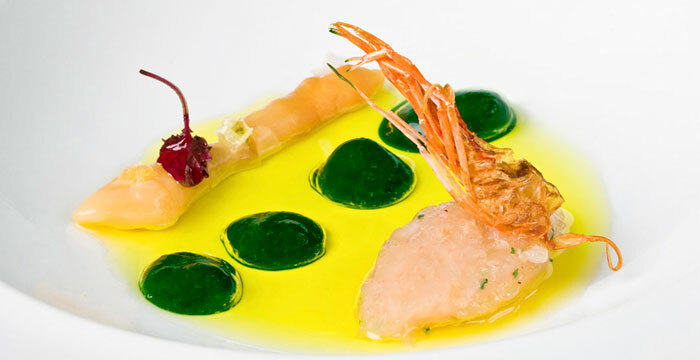 Ángel: My parents are doctors and medical researchers so I have always respected science, the sea and the culinary arts. Day to day, ideas come to me. Mar: Have you thought to author a book ? Ángel: In March 2010, my trilingual book shall be launched in the market in: Madrid Capital, Washington D.C. & Paris, France. The title: MAR CONTRA CORRIENTE which signifies THE SEA AGAINST THE CURRENT. This is not a run of the mill cookbook. This is a book that comes from passion and fully lives up to the challenges of the title. Mar: I look forward to seeing you in Madrid in March and reading your first book. Tell us, what was your first elaborated recipe at home ? Ángel: Well, my 1st recipe prepared at home was a caramel custard dessert. My mother was livid with me for the tremendous mess I made in the kitchen. I was sort of a Dennis the Menace! Mar: Do you cook at home ? Ángel: Never. I enjoy my mortadella hero sandwich and an ice cold coca cola. Mar: Last but not least, music in the kitchen while working ? Incredibly white fleshed silky textured whole fish Borriquete or Burro fish and in English: Rubber Lip Grunt fish, served with mint tea consommé. Ángel explained that he was going to filet the fish for Pilar and I at the table because the stomach of this fish is unedible.